during the Monster Energy NASCAR Cup Series Auto Club 400 at Auto Club Speedway on March 17, 2019 in Fontana, California. 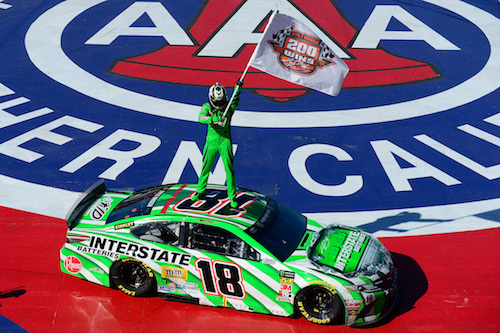 Kyle Busch reached the milestone of 200 wins across NASCAR’s three national series Sunday with his win in the Auto Club 400 Monster Energy NASCAR Cup Series race at Auto Club Speedway in Fontana, Calif. He also became the first repeat Cup Series race winner of 2019, five races into the season, adding to his win at ISM Raceway near Phoenix a week earlier. Team Penske teammates Joey Logano and Brad Keselowski finished second and third. Busch had dominated the race, including winning both 60-lap stages that made up the first 120 laps of the 200-lap race before a pit-road speeding penalty during the caution after the end of the second stage. As a result of the penalty, he restarted the race in the 18th position for the final 80-lap stage of the race. The eventual race winner was well within the top-10 of the running order by the time a cycle of green-flag pit stops began with about 40 laps remaining. Busch stayed out longer than most of his fellow competitors and still hadn’t pitted when the yellow flag waved for the fourth and final time of the race when Darrell Wallace Jr. blew a tire with 37 laps to go. Having not yet pitted, Busch was the race leader at the time of caution. Ryan Blaney stayed out during the last caution, but everyone else headed for pit road with Busch, even though they had pitted just a few laps earlier. On slightly older tires, Blaney lost positions on the final restart as his teammates Keselowski and Logano battled up front ahead of Busch in third. Keselowski and Logano both led laps before Busch took his final lead of the race with 26 laps remaining. Drivers including Busch’s Joe Gibbs Racing teammate Denny Hamlin, Austin Dillon, Aric Almirola led laps early before Busch moved into the top spot for the first time by lap 14. 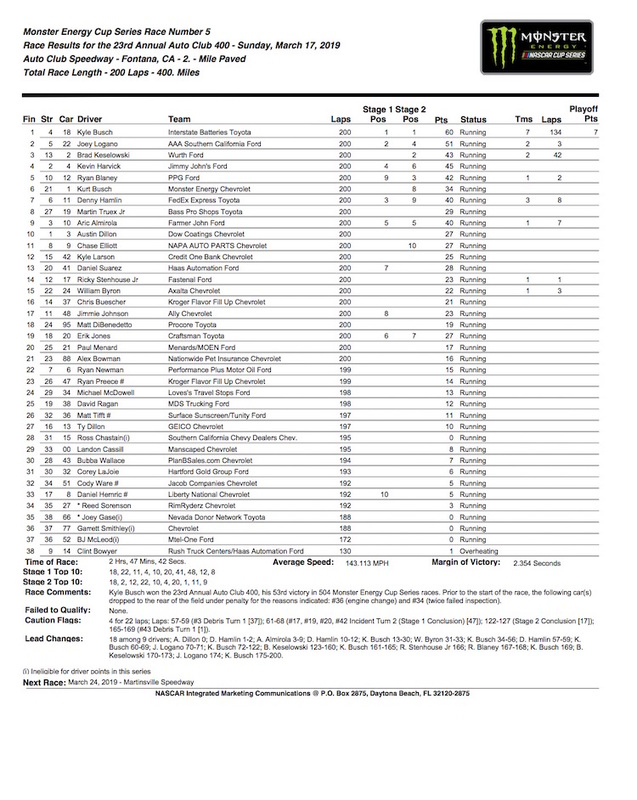 Busch was back up front after the first cycle of green-flag pit stops near the halfway point of the opening stage, but Hamlin, Ricky Stenhouse Jr. and Clint Bowyer stayed out during the first caution of the race when Dillon blew a tire with five laps remaining in the stage. The race restarted with one lap remaining in the stage, and Busch, on newer tires, was able to quickly retake the lead before the yellow flag waved again for a Stenhouse spin. As a result of Stenhouse’s incident, the opening stage ended under yellow. Busch was up front for the restart at the beginning of the second stage, but he was passed by both Logano and Almirola on the restart. On lap 72, though, Busch retook the lead and led the remaining laps of stage two, even maintaining his lead through a green-flag cycle of stops by being one of the final drivers to stop. Kevin Harvick and Blaney rounded out the top-five. Finishing sixth through 10th were Kurt Busch, Hamlin, Martin Truex Jr., Almirola and Dillon.